Known best as the brother of blues guitar legend Johnny Winter, for a period in the 1970s Edgar Winter was one of rock music’s brightest stars, first with his band White Trash and later with The Edgar Winter Group. Between 1971 and 1977 Edgar released three albums with each band, resulting in three top twenty five albums and three top thirty five singles. With “I’ve Got News For You” Cherry Red Records, UK, compiles these six albums, supplemented by twenty eight bonus tracks, a total of ninety spread across the six discs, and documenting this spectacular period in the career of this talented multi-instrumentalist. The box set opens with 1971’s “Introducing Jerry LaCroix” credited to Edgar Winter’s White Trash. The jazz tinged blues rock album showcases Edgar’s versatility, featuring him on lead vocals, piano, organ, alto sax and celeste. Sharing headliner status with lead vocalist, tenor sax and mouth harp player Jerry LaCroix, the LP, which reached on #111 on the Billboard charts, mixes funk and jazz with the underlying rock and roll, giving the band a distinctive sound and setting the stage for much bigger things to come. In its own right, the album has some great moments, highlighted by “Keep Playing That Rock “N” Roll” a hot rocker featuring a guest appearance by former McCoy’s guitarist Rick Derringer, who produced the album, and in addition to his fine lead work on this tune, which saw release as a single b-side, also contributes an incredible solo on “Good Morning Music.” In addition, Edgar’s famous brother guests on the tune which serves as this collection’s title set, delivering an impressive performance on guitar. The album’s ten tracks are supplemented here by five bonus tracks including both side’s of the album’s singles, “Keep Playin’ That Rock “N” Roll” c/w “Give It Everything You Got” and “Where Would I Be” which was backed by the previously mentioned “Good Morning Music.” While neither of the singles dented the charts, they did display the musical talents of White Trash which would soon bear great fruit. Disc five contains 1975’s The Edgar Winter Group “With Rick Derringer,” the title evidence of how integral the producer/guitarist had become to Winter’s musical releases. A funkier, ,more soulful recording than its predecessors, the album stalled at #124 on the charts, Unlike the two previous albums Dan Hartman contributed only three of the LP’s twelve cuts, with Winter and Derringer taking on much larger composing roles. The album certainly has some fine efforts, with the Derringer penned, hard rocking J.A.P. (Just Another Punk) a real standout. The tune is a hot rocker with Derringer’s guitar pushing the beat, and the song is reminiscent of those found on Derringer’s solo efforts. The tracks are much more eclectic, however, as evidenced by “Nothin’ Good Comes Easy” which features classical guitar, banjo and dobro by Paul Prestopino and “Can’t Tell One From Another” with acoustic bass by John Siegler. This eclecticism may well explain the album’s poor sales performance, but certainly does not reflect the quality of the music found within its grooves. Three bonus cuts join the original LP including mono and stereo mixes of the single edit of “Diamond Eyes” a keyboard based pop rock tune penned jointly by Winter and Hartman that sadly failed to chart. The set closes with 1977’s “Recycled” credited to Edgar Winter’s White Trash and marking the return of Jerry LaCroix. The album, produced by Winter himself, is a return to Edgar’s jazzier side, and although filled with fine performances, didn’t catch on with record buyers and failed to crack the Billboard Top 200 album charts. Overall “Recycled” has a Sly Stone feel, and features fine wah wah guitar work by Floyd Radford on the album opener “Puttin’ It Back” and some nice mouth harp performances by LaCroix as on “The In And Out Of Love Blues.” Winter himself shines on Fender Rhodes electric piano on the album closer “Competition.” The LP’s original tracks are supplemented by mono and single edits of “Stickin’ It Out,” a funky jazz rocker which features fine piano and guitar work but failed to chart. 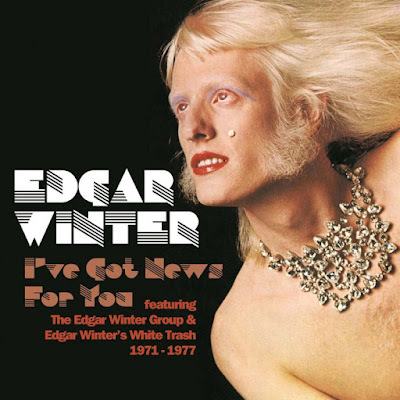 “I’ve Got News For You” subtitled “featuring The Edgar Winter Group & Edgar Winter’s White Trash 1971-1977” documents Edgar Winter at his musical and commercial high point. The set’s six discs and ninety tracks are supplemented with a 20-page full color booklet, featuring complete track listings, album credits, an essay by Malcolm Dome, and photographs of album and single art work. In addition the set features a wonderful mastering job by Tony Dixon and comes in a sturdy clamshell box. “I’ve Got News For You” is highly recommended for Edgar Winter fans, as well as fans of jazz rock and carefree upbeat pop rock music alike, a most pleasant combination and a wonderful reminder of how Winter was a constant on the album and singles charts, as well as AM and FM radio, during the early to middle 1970s. Good review. Although it would have been better if you toned down the mention of how the albums did in the charts, it's great that you reviewed this to let more people know about the release, showing that 2018 proves to be a promising year in reminding people of a time when music was great. Glad you enjoyed the review. The charting information was included for several reasons, for instance the fact that for a two year period Edgar was a huge name and then due to the mere vagary of the market he was nearly forgotten, a sad commentary in my mind. Also, it reinforced the fact that when Edgar teamed with Dan Hartman and Rick Derringer they were a most formidable force. I realize it is an arbitrary measure, but it was essential to the fate of his career, and an indication of how fleeting fame can be.